This centrally located but peaceful apartment is just a one-minute walk from the beach and promenade. It boasts a spacious terrace with lovely views of the Atlantic Sea. Modern and tastefully furnished, the comfortable apartment is equipped with 2 double bedrooms and a single bedroom. A neutral colour scheme features throughout the open plan living room/kitchen. Appliances including an oven and microwave can be used to prepare home cooked meals. A 2nd terrace is also available. Poris de Abona is ideal for guests seeking peace and relaxation surrounded by unspoiled nature. Those looking for something a bit more lively can travel for 30 kilometres to the vibrant areas of Los Cristianos and Playa de las Americas. Santa Cruz is the island’s capital and is 37 kilometres away. It is 20 kilometres to Reina Sofia Tenerife South Airport. The surrounding area is well-serviced by public transportation lines. A pharmacy, bank and supermarket lie just a few metres from the apartment. 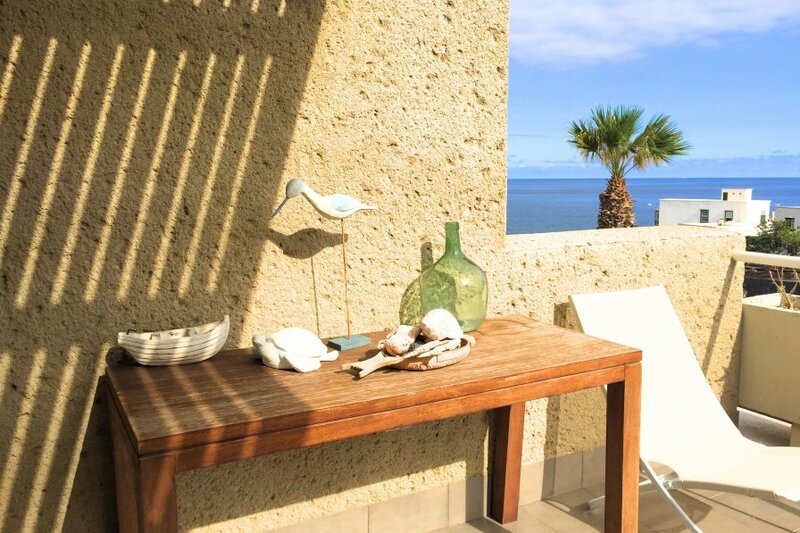 Poris de abona is a very quiet coastal town, perfect for those guests who seek tranquility. It is a sunny area, the apartment has a terrace facing south where you can enjoy the sun in winter. Poris de Abona is also the ideal place for those who practice climbing, since the municipality of Arico is where the most popular climbing area of the Canary Islands are located. Surrounded by pine forests and deep ravines, it is ideal for lovers of this sport, as it has more than 500 well-equipped routes that cover all levels of difficulty -with predominance of intermediate grades- and a maximum height of 35 meters.